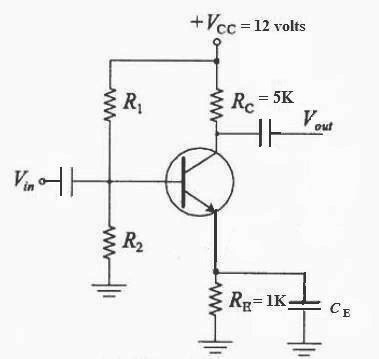 (1) In an amplifier circuit using a transistor the collector current changes by1.224 mA when the emitter current changes by 1.228 mA. 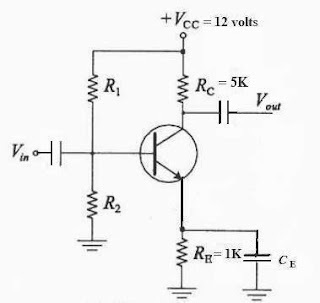 What is the common emitter small signal current gain of the transistor used in the circuit? The small signal common emitter current gain is the ratio of the change in collector current to the change in base current. Since the emitter current is the sum of the collector current and the base current, the change in base current in the present case is 1.228 mA – 1.224 mA which is equal to 0.004 mA. Therefore common emitter small signal current gain (βac) = 1.224/0.004 = 306. The above question appeared in EAMCET Engineering 2004 question paper. Option (c) is the answer. Note that the configuration deoes not matter. This question appeared in EAMCET engineering 2005 question paper. In common emitter configuration a transistor (n-p-n as well as p-n-p) gives both current and voltage amplifications so that there will be appreciable power gain. Therefore the correct option is (c). (4) The adjoining figure shows an n-p-n transistor operated in the common emitter configuration in which the potential divider resistors R1 and R2 provide the base voltage required for forward biasing the base emitter junction. A student wrongly selected too small a value for R1 so that the transistor got saturated. (When a transistor is saturated, its emitter to collector voltage is nearly zero). The collector load resistor RC is 5 KΩ and the emitter resistor RE (used for bias stabilization) is 1 KΩ. If βdc of the transistor is 200 what is the minimum base current required for saturating the transistor? Even though this question may appear to be difficult at the first glance, it is really simple. You have to first calculate the current I which will produce a voltage drop of 12 volts across 6 KΩ. [Since the emitter to collector voltage is nearly zero when the transistor is saturated, the entire supply voltage of 12 volts must be dropped across the resistors RC and RE]. IB = IC/βdc = 2 mA/200 = 0.01 mA = 10 μA. Today we shall discuss a few questions (MCQ) in the section, ‘kinematics in one dimension’. The questions I give you are meant for testing your knowledge, comprehension and the ability for applying what you have learned in this section. 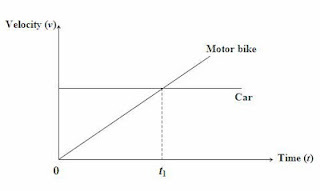 (a) At time t = 0 the car and the motor bike are at rest. 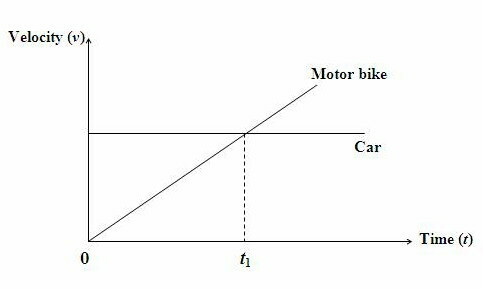 (b) At time t = 0 the car is at rest but the motor bike is moving. (c) The distances traveled by the car and the motor bike in time t1 are equal. (d) The distance traveled by the bike in time t1 is twice the distance traveled by the car in the same time. (e) The distance traveled by the bike in time t1 is half the distance traveled by the car in the same time. You can easily conclude that options (a) and (b) are wrong. To check the remaining options we use the equation of linear motion, s = ut + ½ at2 where s is the displacement in time t, u is the initial velocity and a is the uniform acceleration. The distance traveled by the car in time t1 is vct1 where vc (let us say) is the constant velocity of the car. [The velocity of the car is constant since the velocity-time graph of the car is parallel to the time axis]. [Note that the velocity of the motor bike changes from 0 to vc in time t1. Therefore the distance traveled by the bike in time t1 is half the distance traveled by the car in the same time [Option (e)]. While returning, the sphere of mass m has downward speed v when it passes the edge of the cliff. For calculating the speed with which it strikes the ground at the foot of the cliff, the situation is similar to that of the stone of mass m/4 thrown downwards. Obviously both stones will strike the ground with the same speed [Option (a)]. 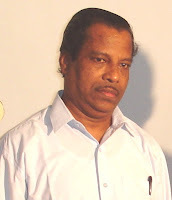 The above question appeared in Karnataka CET 2008 question paper. (We have taken the displacement h and the initial velocity u (both upwards) as positive and that’s why the acceleration due to gravity g is negative). You can find a few more multiple choice practice questions (with solution) in this section here.